I've been wanting to change up our bedroom decor a bit and I've been surfing the web for some inspiration. I'm starting with a few constraints that seem to be more constraining than initially thought. 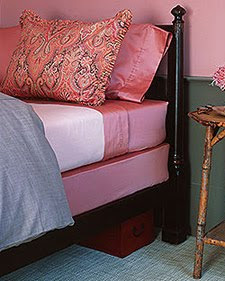 First, I would prefer to change up the room without repainting it another color and without buying new furniture, namely a new headboard. As you may remember, our current bedroom scheme is gold, brown with a touch of purple. I do know that I'd like to replace our bedside tables. They just aren't doing anything for me anymore and I'd like to bring some color into the room via the nighstands. So, I'm scouting Craigslist for some tables that I can jazz up with paint. Justin and I disagree on color options for the bedding which is where 85% of the change to the room is likely to occur. He'd prefer the light/medium blue accent against the brown. It's a classic combination and it would look good but since there is so much blue on the main floor of our house, I was hoping to get a different palette. Clean and simple with a lovely gold or tan accent. I am leaning in several directions. I really like a pink/rose/red/purple combination. I couldn't find any photos of my exact vision but these are sort of the idea. 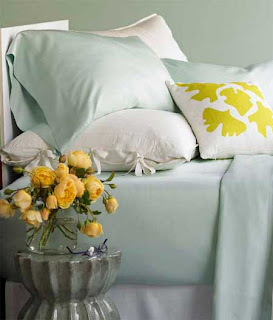 I like the idea of lavendar for the bedspread with white accents like this photo. This would save me from buying new rugs. 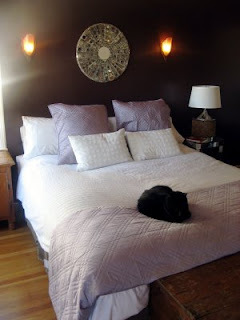 Right now I have a purple shag rug in the bedroom that would go well with this scheme and the black cat for the foot of the bed. 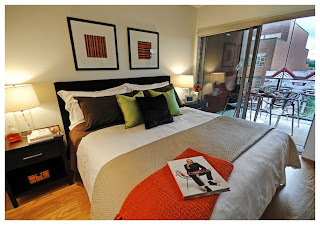 And I'm loving the idea of orange for the bedroom. 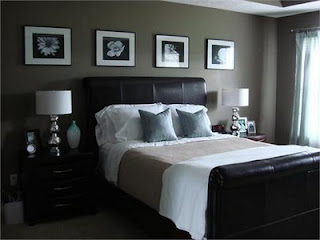 These rooms are gorgeous and would work fine with my existing black furniture and brown walls. Love the green and teal accents. I could do that! Well, it hasn't been blogging, that's for sure. But the bungalow is coming along nicely. We finished up the fireplace prep and got the gutters installed and enough exterior paint on the house to get us through the winter. Justin found a tool chest at his grandmother's house that he's claimed for his own and started organizing the mounds of hardware and tools we have littering the basement. We've got two interior doors patched and nearly painted and ready to hang...just one more coat of paint likely. Justin's mastering the art of spray painting. When I moved out to Washington from Indiana, I brought 2/3 of my childhood bedroom set but I left the large decorative metal & glass cabinet behind because it just wasn't practical for my college accommodations. Ten years later, I figured it would be a nice addition to my decor and so when I heard that my freshly retired parents were taking a road trip out west, I asked them to bring it along. They trucked it over 3000 miles and we took it another 7 miles down the road to the powdercoater to have it refinished. And now it is reunited with it's furniture mates. I must find something interesting to display in this cabinet. Any thoughts? There are 2 glass shelves that install in the cabinet yet. Just in time for the cold months, we've got our cozy heat insert installed. Everyone's a big fan, especially the cats who sprawl out in front of the fireplace and toast their bellies. The trim pieces are being built custom and we should get those installed at the end of the week. I'm a little nervous about the gas bill...Justin's taken quite a liking to the fire. The last of the outdoor projects should be wrapped up this week as we prepare to hunker down for the winter. Not that this means no further progress on the house, just back to inside tasks. The gutter man has been pushing us off for the last week but claims that he will be on site tomorrow. We'll see. We continued to prepare for his arrival by doing some more minor painting on the porch. Laura has been working away at re-grouting the tile surrounding the fireplace in the living room and completed the grout on the walls yesterday. I wired up the circuit for the upcoming fireplace installation last week, and theoretically by the end of the month we will have a nice cozy hearth to enjoy. When we bought the house and had the inspection it appeared that the light bulbs in the garage were burned out as they did not come on when we went in there. Only after we bought the place and started the renovation did we discover that yes, the garage was wired but was not actually hooked to a source of power. At the time it was a pain but this summer we lived with it. As the days have gotten shorter I decided to remedy this with a kludge using parts found in the basement. Needless to say the fluorescent tubes in the garage do indeed work, and appear to have never been used. We have started making our list of wintertime projects and by all accounts should have plenty to do until spring. Unfortunately much of what we need to do involves painting which is my least favorite. Maybe I will work on teaching the cats to paint trim while we are away at work. From what I can tell they have not been doing much while we are gone, however there are not nearly as many spiders inside as I assumed there would be. Perhaps that is what they do all day.